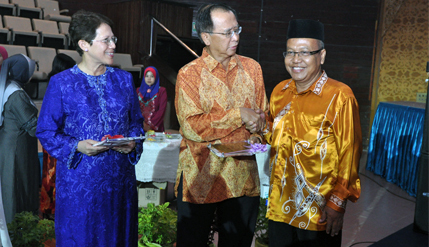 BANGI, 24 Dec 2012 – The National University of Malaysia (UKM) earlier this month feted all the 1032 staff members who received their awards of excellence and another 87 who had retired or are retiring this year at an appreciationceremony at the Dewan Canselor Tun Abdul Razak (DEKTAR) here. 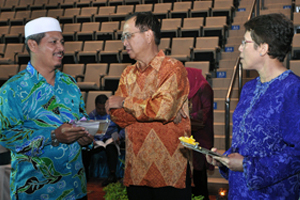 Vice Chancellor, Prof Tan Sri Dato’ Wira Dr Sharifah Hapsah Syed Hasan Shahabudinsaid UKM expects all its staff to move towards excellence by benchmarking with the best in the world. 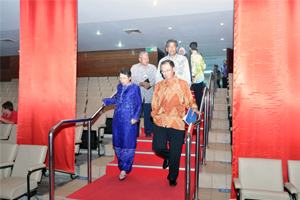 “If we want the best and to be an excellent university, we need to provide the best service to our customers,” she said. The best service comes from staff who are committed to the university’s vision and the transformation plan, saying that those receiving the awards bear the responsibility to influence and guide their collegues to improve their performance to achieve excellence. 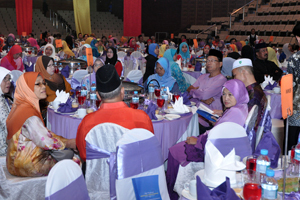 She also expressed her appreciation to the retirees for their services to the university with the hope that they would continue to contribute to UKM as members of the UKM Alumni Employees Association. Prof Dr Musalmah Mazlan speakaing on behalf of those retiring said they were touched by efforts of the management in appreciating their services as well as giving them the opportunity to improve themselves both professionally and personally while in service. The awards were given to 209 recipients for 30 years of service, 65 (20 year service awards) and 758 for excellent service. 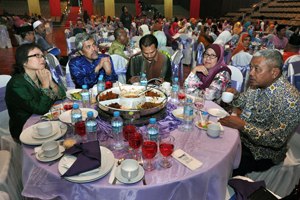 The ceremony was attended by the Chairman of the University Board of Directors, Prof Emeritus Dato’ Dr Mohd Zawawi Ismail, and Deputy Vice-Chancellors and Chairman of the Appreciation Night Committee, Asmahan Musa.